There’s one small hole left not filled by any of the above. A Hasselblad, by its very nature, is not the kind of thing one uses casually. Partially because there’s little point in shooting sloppy medium format and having massive files to curate later, partially because it’s not always socially acceptable to wield something that large, partially because it requires some physical weight commitment (getting harder and harder with current airline restrictions), but mostly because I’ve always felt that the output is quite binary: either it makes you look like a hero, or you crash and burn. Needless to say, casual use tends to result in the latter. If the sole purpose of my excursion or trip is making images, I’ll carry the H6D-100c, with either the H5D-50c or X1D as backup. I know I’m going to get the images I want, at the best possible quality, and the camera isn’t going to be what holds me back. The conundrum left behind is when this is not the case. Yes, as part of my new role and various other non-photographic projects, there are increasingly times when I do things and go places that are not 100% dedicated to the creation of images; at these times there may be some opportunities for photography and you’d like to not compromise too much, which makes an iPhone perhaps a bit too frustrating – especially when you encounter a situation outside its shooting envelope*. Times when for instance you might want to grab a bit of video for family, or you’re not sure if there might be something worth capturing but don’t want to be frustrated later if there is; times when you’re running and gunning and know you’re not going to be able to extract all of that information from a MF sensor, but still would like to make an image. Or times when you’d like to try a longer exposure without packing a tripod. *Not difficult; too bright, too dark, requiring a longer perspective, moving subjects, strange colours/ambient WB, if you want DOF control, the possibility of a decent print later, etc. The iPhone has gotten exponentially better with every generation, and replaced small sensor options, but a proper camera – it isn’t, nor was it meant to be. Medium format is all about pursuing the ultimate image quality – but I’ll be the first to admit there are tradeoffs, and sometimes it isn’t the best tool for the job. I could use my D810 and a fast prime or the 24-120/4 VR Swiss Army knife, but what I think of as the overall ‘commitment factor’ – size x weight x personal pressure put on by carrying a properly serious photographic tool – is just too high, and if I’m willing to accept it, I’d rather carry an X1D instead. (As you might have guessed, my Nikons haven’t seen much action of late – in fact, I think the batteries may all have fully self-discharged by now). I suppose this is the role that was traditionally filled by the compact point and shoot or pocket camera – be it something fixed lens like a Ricoh GR or Olympus Mju II – or perhaps a Leica and small lens, which would still be better than lugging a 4×5 or medium format. Sadly, in the digital era, we saw a proliferation of really quite bad and generically fiddly small sensor things that have gone extinct post-smartphone; the serious enthusiast options are very, very limited. You’ll probably recall I was very fond of the 2013 APSC Ricoh GR (V) and Nikon Coolpix A, and subsequently, the Leica Q. The D Lux 109/ LX100 weren’t bad, either. The newest of those cameras is two years old now, and whilst age doesn’t necessarily mean implicitly guaranteed degradation in quality, there were enough color issues with the Q (especially in the red channel) that it was causing me some serious frustration in matching files, and the others had quite limited shooting envelopes. I tried the GR II and LX100 again recently – and they really do feel quite slow and uncertain compared to the latest mirrorless gear. Needless to say: I didn’t feel like buying any of these again, because I remember why I sold them to begin with. Here’s my question: it’s been several years, there’s an obvious hole in the market, and there’s been plenty of time for more than one development cycle in some cases – so where are the proper enthusiast compacts? In other words: either the non-photographer’s ‘serious camera’, or the photographer’s ‘un-camera’. The kind of thing we chuck in a briefcase when you’re going to a meeting but want to make sure you’re covered just in case, or the kind of thing your mum might bother to learn when she’s going on the trip of a lifetime. Sure, there are a lot of spec chasers: the unmentioned elephant in the room being the RX100 series, of which I’ve owned the Mark I and Mark III – but what Sony is asking for the Mark V is borderline criminal. You can buy a midrange DSLR or mirrorless camera for that kind of money, with much better image quality and a lot more flexibility if you need it. The biggest problem I find with the newer non-interchangeable lens enthusiast compacts** – RX100, LX100, TZ10, TZ100 etc – are that they tend to be rather ambitious with the lens spec, but underachieving in practice. This is either because the lenses just have to correct for too many focal lengths, or because marketing decided f1.4 was necessary, or because there are production tolerance issues: understandable with complex aspherical designs that must also collapse. In short: no go. **Fixed prime lens excluded, because I find myself often wanting a more compressed perspective, and the fixed prime ‘compacts’ like the RX1RII, X100F, Q – other than the GR – aren’t really compact or cheap enough to justify as an occasional use camera. What about the E-M1.2, you might ask? For somewhat convoluted reasons mostly to do with little video work on the horizon, I didn’t land up buying one in the end – and it’s a significant investment to make. That, and it’s not a very small camera especially once you put its ideal partner 12-100/4 on it. We’re back to X1D levels of commitment factor, and I’ve already got one of those. But I didn’t rule out a system camera entirely; some of you may recall my dalliance with the small DSLRs: a whole string of Nikons ending in the D5500, but then jumping to the Canon 100D (because they have AF pancake primes, which Nikon does not), which in the end went to a cousin who needed something for a media studies course. I thought about going this route again, but decided against it: with a Nikon mount body, I tended to land up putting my other lenses on it: i.e. the big guns. And that defeats the point of small and light and unobtrusive entirely. That leaves the mirrorless formats: M4/3 being the obvious one, but also Fuji X and Canon EOS M. (Nikon 1 is in no-mans’ land, and the cameras are neither cheap nor is image quality per dollar particularly impressive.) I landed up back in the M4/3 camp because it’s the only one of the three with serious stabilisation options, plus a much better price-performance ratio than the other two. I realise this is ironic coming from a medium format shooter, and owner of three Hasselblads – but it honestly pains me to overspend on something that will never deliver any return on investment. Really, my priority list looks like size > image quality > price; the best fit is the Panasonic GM5 or GM1, but those were honestly a bit too small to be comfortable. The GM1 has a small shooting envelope thanks to its lack of finder; the GM5’s finder is one of the smallest EVFs I’ve ever seen (and an uncomfortably tiny EVF was the reason I sold the RX100III) – and both are much older cameras, which are extremely difficult to find. Both are also only 10-bit shooters. A viewfinder being necessary, the LX100, GX85 and E-M10 Mark II were left in the running. I was seriously looking at the LX100 because of its external mechanical controls and overall haptics, which remain excellent; but its limited resolution and overall feeling of being slightly sluggish in operating speed, focusing certainty and stabiliser performance ruled it out. That, and it was nearly the most expensive option here. The E-M10 Mark II felt like familiar ground, but I didn’t like some of the materials and the bundled kit electro-zoom pancake; it was quite a bit cheaper than the Panasonics, though – so I suppose you get what you pay for. The Panasonic GX85 is available here ($697 at time of writing, in kit form with the 12-32) from B&H and Amazon. I sold my (f)un-camera a while ago (Coolpix A) because after a lot of trying, I felt 28 mm eq. ultimately didn’t suit me. Since then, I’ve been looking for a replacement with at least similar image quality, preferably with faster AF and a more substantial grip, for those times when I don’t want to take my D800E. A few weeks ago I came upon a scene which more than deserved a picture, of course with no camera at hand. That, and the current Black Friday sales and winter cashbacks, made me check the market yet again. I guess a Z6 with a 35/40 mm AF-pancake would suit me well, but I’m not willing to spend that kind of money, nor does Nikon have such a Z-lens at the moment. I absolutely adore the X-T bodies for their design and their elegant physical control paradigm, and while e.g. a X-T3 testfile from the net showed very graceful highlight handling, I’m still not happy with how LR deals with foliage and grass. Trying to avoid the rather bloated profile of a typical DSLR, and the missing micro AF adjustment in the otherwise often very good entry models (e.g. D5500), I’m now eyeing an EM 5.2 + Oly 17 1.8 or a Sony A7 II + Samyang 35 2.8 (or used Zeiss 35 1.8) kit, which go for a 1000 and 1150 euro respectively these days, new. Not that this matters all that much, but one particular offer bundles the Sony with a second battery, 32 Gb memory card, and peli-case, no extra charge. And I’ve got an unused C/Y 85 2.8 laying around that may fit the Sony well. I’m well aware of the differences that follow from the very different sensor sizes. And perhaps I’d blame the Oly for its low pixel count or lower DR, perhaps I’d expect more from the FF sensor than the camera can give me (and hate the size of the uncompressed raws), but perhaps someone here could chime in on the actual deployment of the cameras and the euro per pixel quality they can deliver? By the way: Today I have posted a nice pic in my blog that I have shot with my “new” EUR 95,– used “Superbaby”, the 13-years old Sony DSC – R1. I really really enjoy the Hasselblad-like operation: “To work with it, is like holding a large coconut in your hand.” A saying, Alexander Borell, one of the authors of the german photographic paper “ColorFoto” did some 38 years ago in his report of the Rolleiflex SL 2000, the ancestor of the Sony DSC – R1. And Alexander LOVED Coconuts!!! I wish Sony would experiment with ergonomics again as they did back in the R1, F808 days…rather than settling for (often poor) generic solutions now. LCD as AF touchpad, and the grip. I don’t use the d-pad for AF selection either – and I’ve got small hands. I still have my Ricoh GR which I occasionally carry when I don’t think I will shoot much. But for all intents of purposes it’s been largely replaced by my Pen-F. Having a viewfinder is a big deal to me. If I need compactness I just slap on a pancake and shoot with my Pen-F. In fact after a year of owning the Pen-F it’s been the only camera I use anymore. It’s not without its annoyances.. the biggest one being the awkward placement of the SD card itself, which can be a major pain when doing quick product shoots. Woohoo! I just sold my GR and scooped the GX85 and kit lens today. I’m excited and can’t wait to put it in to use. My next lens purchase would be the 15/1.7 (close to GR’s 28mm focal length) and 42.5/1.7 (so I won’t need to take the D810 and 85/1.8). I’m very new to this m4/3 system. The dual IS is such a luxury! Quick question: going in a trip (London, Barcelona, and some cities of Portugal) next month; vacation trip with girlfreind, not a photographic one – hence not wasting much time changing lenses for stills / movies will be a priority (bought a gimbal to “simulate” tripod pans and slider use). Good image quality wanted – but professional level not needed. The camera will be the GX85 (maybe a LX100 or X100s as second body). Will bring some primes only because they are small and light – Panasonic’s 12mm 2.5 and 20mm 1.7, and for some DOF when needed, I have the Olympus 45mm 1.8, but thinking about changing it for the Panny 42,5mm 1.7 – what are your impressions of this lens? My idea is use the 12-32 zoom as the main workhorse, or maybe the 14-42 version II. Your impressions about the 12-32 are still favorable? For long zoom, will bring the 45-175mm zoom – small, and very good image in f4-5.6. This set is enough (since you know most of the places of these cities) or is somewhat exagerated? More than enough. Haven’t used the 45-175, but the 35-100 is excellent and very small. Add a fast prime of your choice to taste. The Panasonic 42.5 will work better than the Olympus on a GX85 because you will get dual IS. Optics are comparable. Yeah, getting the 42,5 because of Dual IS. Good to know that the optics are comparable, I love the Oly 45mm. How are your feelings about the 15mm 1.7? Thinking about a fast wide lens (the f/2.5 of the Panasonic 14mm sometimes is not enough for interiors) – but the price…thinking about a Rokinon 12mm f/2.0 (manual focusing is no problem). 15mm is wide enough for most uses? When its not appropriate to carry my X1D, I bring my gx8 with the Leicasonic Nocticron! It so much fun! The Panasonic GM1/GM5 are actually 12-bit RAW shooters. It’s once you go above 1/500 mechanical shutter speed that you need to use the electronic shutter/go down to 10-bit shooting. Which in the tropics, is a lot of the time – and precisely when you have brighter, higher contrast scenes that demand the finer tonal gradation of more bits…you don’t have them. Ah.. the un-camera in film days was Yashica T4. True pocketable compact with good lens. Digital has made our life more complex with so many choices that need to be reevaluated with every product upgrade cycle. Grrrr. I’d made the jump to Sony APS-C E-Mount (a6300 these days) and loved the increased DR and resolution. Borrowed my stepson’s E-M10 II over the weekend and was immediately brought back to why I love Micro 4/3… size, color (especially Olympus, but pretty much anything is better than Sony), stabilizer. Had a GX85 for a bit for video work, and have been tempted to go back. This didn’t help that any. Here is a question that may be a bit more difficult to answer for someone who only prints MF these days. I have been basically satisfied with the quality of prints I’m able to achieve using my Nikon A in good light. I’m wondering if at around the 12-14mm range, if this sensor lens combination will produce comparable results when printing? which lenses do you use with yout Lumix GX85? 12-32 kit pancake, 15/1.7, 42.5/1.7, 35-100 collapsible. How is the Lumix 15/1.7 compared to the lens in the Ricoh GR? I like my 42.5/1.7, but I am not that happy with my Lumix 25/1.7 except its size. It is just not as good as the 42.5/1.7. Do you have any experience with one of the other 25mm lens choices from Pana or Oly? And what about IQ between the GR lens and the 15/1.7? My un-camera adventure started with my Coolpix A. I wasn’t expecting much out of it but now it comes everywhere with me and makes up about 80% of my shooting. Its amazing the shots one can make when one a) isn’t fearing for their gear’s safety and b) isn’t in “photographer mode”. It changed my photography forever. IMHO Nikon needs to slap the new 24MP sensor in there and maybe some AF/MF improvements and call it a day. A new GR would also suffice. Hell, while we’re dreaming, it would be nice if Fuji made an X100 with a LITTLE bit of a smaller body in a 28mm and 50mm version? Why not? As a M4/3 shooter primarily, the Nikon DL were some of the few 1″ compacts that really interested me over the last few years… The UWA model in particular would’ve had zero competition, even today, such a shame they never got a chance. I really wonder why they got cancelled. Lack of demand seems unlikely. Having shot with a Nikon A for quite sometime I’m still not at all convinced that the 24mp would be as big of difference as people seem to think. At least for me, shutter speed below at or below 1/60s pretty much requires burst mode for me to get a keeper in the middle of a burst consistently. Maybe I should drink less coffee. And that’s where having a finder of some sort comes in useful: you gain quite a bit of stability by bracing it against your face. But I do agree – handheld at arms’ length, I don’t think there’s that much benefit to going to 24MP either most of the time. Fascinating that we arrived at the same point, via almost the same road. I’ve been shooting with a Ricoh GR for ages, along with an E-M1, and was looking for just this: something smaller than the E-M1, but less of a one-trick pony than the GR (great though that pony is.) So I bought a Sony RX100 III (as the IV and V were just too pricey). Slow, inaccurate autofocus, and an unacceptably decentered lens. Returned it for the Panasonic LX10. Here the decentering was just egregious — I’ve never seen anything like it on even the lousiest kit zoom: asymmetrical softness almost halfway into the frame at certain focal lengths. So… voila: the GX85. The 12-32 is lovely: the tiniest bit of decentering (which I expect in any zoom); but wickedly sharp in the center, with surprisingly decent bokeh. Something you may not know about the GX85: it has a cult following among run-and-gun videographers, who have now hacked it to unlock Cinelike D and V profiles. They used the smartphone app, and sneakily sent the camera instructions that it didn’t expect, revealing hidden profiles. Seems the model has the functionality, but was deliberately crippled. There may be other secrets in there as well. By the way, I find the build quality of the GX85 utterly solid. But I’m sold on polycarbonates — most people aren’t. Sophisticated plastic over a well-designed metal chassis makes me happy: I expect this would survive a fall onto a hard surface with less damage to the innards than the LX100 (similar design, but all-metal). Properly engineered plastics flex and absorb shock. I was raised on Leica M’s — it’s hard to ditch the preference for a solid chunk of metal — but materials engineering has moved on. And the GX85 isn’t flimsy — it’s surprisingly dense. If you can get past the feeling of the surface (not cold to the touch), this camera is ergonomically the closest thing to an M3 or a Konica Hexar you’re likely to find these days. I’ll always fetishize chromed brass gear, but the future belongs to the Zeiss Touit and the Nikon D5600. Interesting; I’m going to have to look into this. 4K and log profiles on the cheap? Count me in. I definitely agree regarding silver-painted polycarbonate. Bought the black model. Another interesting thing about this camera is that it seems to be a sort of Goldilocks model in the line: the two models above it — the G85 and the GH5 — are evincing problems that you don’t find with the GX85 (weird stabilizer issues when panning, etc.) And the models below just don’t have anywhere near the functionality. It may be destined to become an unexpected classic, like the Nikon D700. Oh, and if you mount the Olympus 25/1.8, with a cheap Leica-cloned hood from Amazon (vented, metal), it actually looks pretty cool. It’s great to see the gx85 get the recognition it deserves. I mostly use it with the Panasonic 20mm which is a brilliant lens even at its widest aperture 1.7. See my site for examples. My canon 5d3 is hardly used. Unfortunately it can get a little noisy especially if you need to lift the shadows or exposure in raw processing. I tend to overexposed a little and bring it down a little in ACR. I’m hoping to get the Sony rx1r at some point. I have the Panasonic 20mm on a GX85. It’s a fabulous combo. For what it’s worth, the GX85 focuses the 20mm much better than the Olympus bodies. I used to have the original Oly OMD-EM5. 20mm was slow to focus on that body. It’s great on the GX85, I can’t tell difference in focusing speed between that lens and the 12-32. I think somehow that Panasonic has invested the time to optimize focusing on the 20mm and Olympus never bothered to. I also have the older Panasonic 14mm pancake which I got used for cheap. Another great lens for the GX85. Sharp, fast enough to help a lot with low light, and very tiny (smaller even than the 12-32). Well recommended. I have larger lenses too but somehow the 20mm and 14mm seem to be mounted 90% of the time. Thank you for another fantastic and entertaining article. I’m quite happy with my current setup: Pen E-Pl7 + VF-4 + 12mm/2. I like the styling, the build quality, responsiveness, colour reproduction in JPEG and wonderfull viewfinder. I’m looking for a second lens to compliment the 12mm/2, what would be your recommendation? The purpose is for general photography/street. I think you need to move up at least two sensor sizes to see a really significant improvement across the board – i.e. 1″ to APSC; M4/3 to FF; APSC to 44×33, FF to 645. The upper limit to your carry limit and budget is the anchor; then you go down from there. Or.. could accept having a mirror in your camera and enjoy one of Canon or Nikon’s excellent FF offerings. It’s not like it would be as large as a mirrorless medium format. 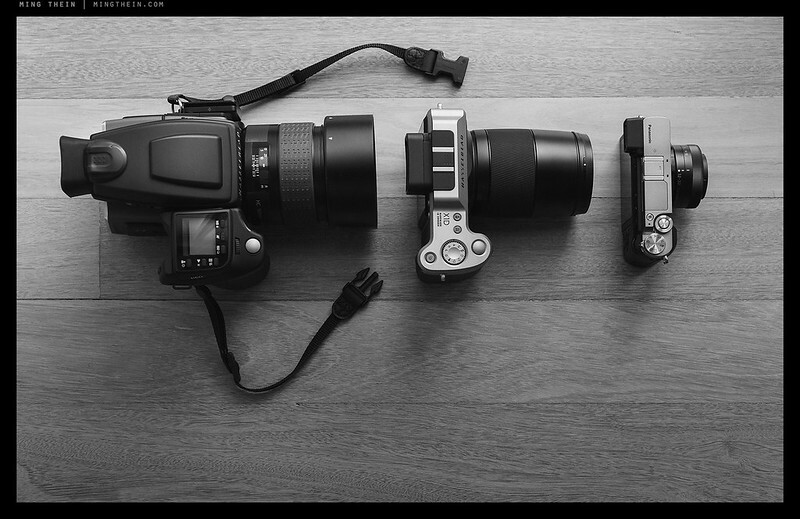 Actually, the smallest FF DSLR is quite a bit larger than an X1D (which itself is a similar size to an E-M1.2). Amazing how the search for a ‘compact’ continues….guess the laws of physics are yet to be defied in the photography world! Funnily enough I’ve been getting a bit frustrated with the GR (in the modern world it really is too slow) and been considering my options for a replacement. I may try this. If truth be told, I rarely use the DSLR preferring smaller and lighter gear and so tend to use the GR mostly. I think I am accepting compromises more nowadays. The GR requires pacing; not sure if the GRII is faster, but they’ve never been spray and pray cameras. Having the right control setup is quite critical, too – fortunately that’s one thing that’s at least quite easy to do with it. I picked up a GX85 in a cashback deal for £349 with the 12-32. An absolute steal! That’s an insanely good price. Enjoy! I’ve been sorely tempted by Panasonic’s latest products, notably the G85. My wife’s stylus 1 is a remarkably fun little camera, but hoo that interface is headache producing. While I can’t see myself with an uncamera precisely, I can see myself with a cameralet, which would probably be the G85 and a pancake, or probably for getting more serious a faster zoom. Since it’s either the phone or my DX DSLR, I’d replace the DSLR with the cameralet and finally rationalize my dedication and skills with the tools I use for travel photography. The DSLR would hang around for special occasions and events needing its talents. But an uncamera or a cameralet scratches the photographic itch just fine. My old piano teacher once said that only a few of us must suffer for our art. The rest of us can just have fun. On a side note, do you know what is happening with the CFV back? it was discontinued some time ago. Will there be a new one coming? Really? I can’t see it anywhere. I think the Nikon 1 is actually a good camera ruined by terrible pricing when it was new. It’s very small and light, with terrific battery life. The colors are pleasant and accurate, it has great auto focus speed and accuracy and it’s shutter frame rate and shutter speed are both outstanding. The lenses are very small and light as well, very sharp with pleasant rendering. I picked up a second hand v1 with the 18.5mm lens for SGD $150. Added an UWA the 6.7-13. Now I’m thinking of getting another 2nd hand v1 with the 10-30 + 30-110 for $300 SGD. At these prices they are ideal when I’m outdoor with my kid or friends, when I do not want to carry something expensive or something that requires manual focus. Not just bad pricing: bad marketing, too. In a lot of ways the 1 series really represented sufficiency for the masses, especially in focus performance for the usual family and social applications. Too bad it didn’t stick… It does go to show though the spec sheet sells better than actual performance a lot of the time. I passed because the prices here are *still* silly. Overpriced, not compatible with existing Nikon flash system, Nikon didn’t know what to do with the enthusiast model and, last but not least, no complete lens set (or clear roadmap for it). Nikon lost me to Olympus for it. I’m pretty sure it was compatible…I definitely remember seeing somebody use an SB900 on it. By my knowledge from extensive research online and a visit to my local camera store it was not compatible with the Nikon DSLR flash system out of the box. Different hotshoe and no way to trigger an existing Nikon flash remotely using Nikon’s CLS. So perhaps you could work around the barricades Nikon threw up, but is not providing compatibility with your existing system out of the box a good way to entice your customers to stay with your brand? Or maybe they changed their mind later, when it was too late? May well have been – didn’t look much further into it as the camera didn’t really make sense at the time. The 1 V3 has a weird hotshoe too, so I guess they didn’t change it. Interesting conundrum. You’re quite right about the E-M1 mark ii once paired with a 12-200mm; you may as well have brought the DSLR. I would’ve thought the X1D is still your best option in this case? Yes, the X1D is preferable in that case and precisely why I didn’t go the 12-100 route. You mean to say that you are NOT sending me your D810?! Just curious… what is your kit (lens) selection of choice for the GX85? Mainly sticking with the 12-32? Or other prime set? Ming, I would suggest you to try the RX100mk5 or wait for the mark 6 to be announced. Without considering the relatively steep price, which at the end of the day doesn’t have any direct effect on IQ (at least to the best of my knowledge 😉 the image quality off that little camera just blew me away. I actually went as far as to print an image taken with my RX100mk5 at 18×24 and placing it into the same Itoya folder where all my other MF images are. Funnily enough, upon asking friends what camera took the image, I have yet to have anyone guess correctly…. To their consternation, when I told them it was a 1 inch sensor pocket-size camera they just rolled their eyes in disbelief! Ming – Your comment here “no way I could justify the price” and the comment in your article that the cost of the Sony RX100mk5 is “borderline criminal,” are quite refreshing. Considering your camera inventory, and position at Hasselblad, I’m impressed that you are still ‘in touch’ with the average photographer. I completely agree with your cost analysis of the Nikon 1, Sony RX100mk5, and the EM1.2. You continue to pleasantly surprise me sir – thank you for your contributions to the photo community. It’s not an absolute number…it’s a question of relative value, I guess – for intent and purpose. But – thanks! No viewfinder, it’s more expensive and has a poorer lens than the GR…plus I wanted some reach. Ah make sense, I am also in the market for a small travel camera so I thought I would ask. I really enjoy reading your articles, they’re very insightful. Thanks Ming, that was an interesting read. At an Olympus event last weekend I had the chance to try the E-M10ii and E-M5ii for an hour out and about, my first time shooting with an Olympus camera beyond “squint through the viewfinder in the camera shop and push the button, imagining what the results might be like”. I’d gone because the E-M10ii looked to be just the size and weight that I wanted to carry when walking or out and about. But after 15 minutes I really wasn’t enjoying it; the refresh rate of the EVF was too low and I swear there was a delay/freeze when shooting. The E-M5ii was much more to my tastes and much to my surprise I enjoyed shooting with it (though didn’t master focus point selection, something the expert running the event didn’t touch on). Particularly when paired with their 12-40mm lens, which is a cracker! I have a few files here and there looks to be more detail than from my ageing Nikon D300. I completely agree re their pancake, if I got the E-M10ii I was going to pair it with the Panasonic pancake instead. Now that I know I’d want the E-M5ii body I’m more conflicted over the μ4/3 system, as that plus a larger zoom is lighter than other systems – but not by much. So it’s good to read your thoughts. Due to how poorly the event was run (there’s an essay-worth in that) I didn’t get to handle the PEN-F, or the E-M1 – but that’s so large and heavy and I might as well go for a small DSLR if I went that route. I agree with you, and it’s one of the reasons why I skipped the EM10.2 – as cheap as it was. But it doesn’t play so nice with the Panasonic pancake (tried that in the past, too, with the E-M1) because there are no corrections built in, and there’s no way of manual focusing as the thing has no focusing ring and Olympus firmware doesn’t seem to support digital MF controls. AFAIK all Oly bodies since the E-M1 will apply the same exact corrections with either brand’s lenses as any Pana body (Pana got it’s act together in this regard much sooner, around the time of the G5 or G6 IIRC)… The lack of MF w/the 12-32 on Oly bodies is in fact an inconvenience, tho I still enjoy using it with my E-M5 II. Lately I tend to bounce more between the 35-100 and an UWA tho, the 12-32 is feeling neglected. Ah – last time I tried was on an E-M5 and E-PM1. I used to be a Nikon shooter (D300, 18-200 DX VR, 12-24 DX, 105 f2.8 VR micro, 70-200 f2.8 VR) but started to dislike the weight. Since I’m not a pro I started looking for lighter alternatives. Tried a P7700 compact but was very disappointed by its speed (or rather, lack there of). Then I tried an Olympus OM-D EM-10 kit (with the 14-42 power zoom) when it was on sale. After an initial steep learning curve setting up the camera I started enjoying shooting with it more and more. IQ is on par or better than my Nikon to my eyes. I like the small size, light weigt and built in flash that can remote control off camera flashes (I bought a Nissin i40, great litte flash that offers complete manual control also). The 14-42 power zoom is an OK lens to operate, but you have to get used to it. One advantage it has over manual zoom lenses is that you can remote control it from a smartphone with an Olympus app. I enjoyed the EM-10 so much I added a few more lenses to my kit (OK, I won’t deny a bit of GAS hit me). My kit now includes the 14-150 mm & 9-18 mm zooms, 17 mm f1.8 & 45 mm f1.8 primes and 60 mm f2.8 macro. None of these are pro lenses but they are light weight and good enough for me. The whole kit offers me more options than my Nikon kit and fits in an unbelievably small bag that weighs much much less than even a part of the Nikon kit. I haven’t touched my Nikon in more than a year. Already sold the heavy FF lenses and will be selling the rest soon. Olympus made me enjoy photography again and even had me rediscover the fun of shooting with primes. I will never look at a heavy DSLR again. I’m now thinking of getting a second body (Olympus is currently offerin a rebate where I live), probably an EM-10 mk II because of the built in flash and value for money. The E-M10 II has one advantage over the E-M5 II, touchpad AF point selection when using the EVF, which Panasonic bodies have featured going back several generations (to the G6 at least)… I’ve tried that on a G6 and I quite like it, but it wasn’t enough to put me off getting an E-M5 II a year and a half ago. It’s not any larger than the E-M10 II and has quite a few advantages, I was cross shopping it vs the GX8 tho. Both the GX85 & G85 look like stronger values today, specially if you care about video or C-AF performance. Oly really needs to start letting OSPDAF trickle down it’s lineup IMO. There’s still a few things I like on Oly bodies over Panasonic’s, particularly on the stills side of the equation (HR mode, nifty long exposure modes, better EFC implemention with no DR penalty, etc), but Pana has been very aggressive on overall value. Pana’s lens lineup has also been putting size as a higher priority than anything on Oly’s side (short of the 9-18)… I started with 1 Pana body + 2 lenses from each brand, and now have 1 body from each (GM1) and mostly Pana or third party lenses. Have you ever considered the Fuji system? As the years have rolled by packing the Nikon gear took the fun out of photography. I now have X100S, X-E1, X-T1, 18mm, 18-55mm, and 55-200mm. This might not be the way to go for a pro, however the fun is back for me. I suspect that the X-Trans CFA would not cooperate with Ming’s workflow, nor his intolerance for visual artifacts. It is a shame that Fuji doesn’t make a camera with an EVF that uses a Bayer sensor but could take advantage of some of their nice lenses. That was an issue for a while, but ACR solved that at the end of 2015. I owned an X-T1 for a while but found I just didn’t like the bodies very much, and they weren’t cheap, either. Been there, didn’t work for me – both size and cost were back to serious camera levels. I always was attracted by the idea behind the Sigma DP series of having the same body with the different fixed lenses (especially the 28mm and 75mm equiv). Unfortunately, the compromises with the Foveon chip did not suit me. To take it even further, a little bit of waterproofing (think Leica X-U) would really add some sweetness to it. As I haven’t found anything like this, I used the 40mm or 50mm STH on the 6D as my go to camera. Being a DSLR, I can often leave the charger at home making the package even simpler/smaller. You can go the external charger route – the Watson duo charger with BLH7 inserts available from B&H can charge two GX85 batteries at the same time in around 1h. The ideal (and consumer friendly) approach would be to offer in camera USB charging AND bundle the charger… I think Sony does that? Then again, they have the most dismal battery life of all the mirrorless players. An alternative to in-camera charging that still offers most of the same convenience are third party USB chargers, been using a couple for my GM1 & E-M5 II… It’s definitely nice to be able to charge in the car off a phone charger or in a bag off a USB pack. My pick to. just got 2 gx85’s to compliment my 2 fullframes, after testing a bunch off small soulution cameras. after trying the gx85 i was sold. sold off my canon 200mm 1.8 f. got a canon 70-200mm 2.8f non is, 2 gx85 bodies. the 12-32, 20mm 1.7, oly 45 1.8f and the 75mm 1.8f for the selling money. Even had some cash left. Used a mft body at a wedding this weekend. Not exclusively but as a part of the job. Not fully confident going all mft on paid jobs from one day to another. need to be sure i deliver work just as good first. During the ceremony i used the 85/oly 75mm combo not to draw attention. they fit right in with the rest of the pictures taken with my fullframes. Except for maybe a centimeter or so of lens protrusion, the RX1RII actually has a smaller footprint than the GX85. I know its much more expensive but that lens is just off the charts good. You have to really like 35mm, and yes, it’s crazy expensive – this is not a casual camera…at that price, it’s one you’ve got to seriously love. I’m hoping the next version of the RX1R has some of the A9’s DNA with respect to speed, accuracy, EVF and haptics. I really like the Pro feel of the A9…the changes are subtle but effective. I owned a GX80 (85) for a while but must admit I sold it quite quickly. Amazing stabilisation but I found the EVF to be terrible. I realise of course I am in the minority in this criticism, I think it depends on your eyesight and the dioptre setting you end up using. I have the G85, and it seems to be an SLR-shaped version of the GX85, and its EVF is actually pretty good. While I’ve not seen the GX85’s EVF, based on comparing specs, the G85’s is a different EVF, and might be worth checking out if you like the sensor. I’ve found its handling to be very good, comparable to the D5500, with all of its controls easily falling to hand, unlike many other mirrorless cameras. It has a really sweet-sounding shutter too. The stabilizer is good, and is Dual-IS, working well with lenses like the 42/1.7. The only bad thing I’ve found so far is fairly visible stair-stepping on straight lines using Adobe RAW conversion, but I bought it for video, so that’s not a big deal for me. Isn’t one of the issues with the GX85 that the viewfinder is 16:9 instead of 4:3? Similar setup as with the older GX7, isn’t it a field sequential panel too? It got heavy criticism on the GX7 and yet they went down that road again… I guess at that price point they had to cut *some* corner, compared to its competition there’s little else to fault on the GX85. I’m not sure it is; I don’t see the tearing. Yes. Absolutely on the 12-100. I just got back yesterday from three weeks in Yellowstone and Grand Teton National Parks in Wyoming. The 12-100 on the EM-1 took 90% of my images. Wonderful lens also with great closeup capabilties and easy manual focus. FWIW the other 10% were animal images (bears, elk, antelope, bison) with the Panasonic 100-300 ii. How do you feel about the GX85’s colors compared to earlier Panny cameras? It seems a lot less cyan than older models. Also, got a prime for the wider end yet? Those Sony RX series cameras are designed for what I call the “airport market”, where people with more money than brains grab one at the tax free shops. I’m still happy with my Ricoh GR II, and my Fujfilm X-T2 gets a great workout from all the classic lenses that I use. But at the end of the day, when I want the quality for something which will last, out comes the D810 and the Zeiss lenses. I’m not sure they’re that bad. They’re very expensive, sure, but there’s a long spec sheet crammed in there; I suppose they’re good for the above-average person who wants a bit more but not so much that you have to commit to it. It isn’t going to work for every photographer because those of us who are really serious will start to feel that some of those ‘features’ are a little more gimmicky than useful. That said, I liked the original RX100 very much, but the subsequent MkIII I owned – not at all. No idea why…perhaps it has something to do with expectations over time. It’s a camera I really wanted to like, but the deep-dive menus and price just wouldn’t let me pull the trigger on it. You might think twice before disparaging people who buy any particular device. They probably have reasons other than more money than brains. I spent a lot of time looking for a small camera with decent image quality for use when the cell phone is too limited and the D800 or 4×5 is too bulky. I ended up with the RX100V and eventually accepted the price premium as it’s major fault (which once purchased, tends to fade from notice). As someone with presbyopia (expected for someone in their late 40s) I need a viewfinder and a pocketable camera. There are a lot of high quality options out there at lesser prices (GR, LX10, etc) but no others that met all my needs. The Sony is far from perfect, but it lets me get shots I couldn’t get if I hadn’t purchased it. The viewfinder is the kicker – some have it, but some aren’t so usable. The GM5 and RX100III both seemed like a good idea, but those finders were so compromised that I never used them when I had them – I still couldn’t really see what I was aiming at! I agree it’s not as good of a view finder as I’d like, but I can make it work. Why they didn’t just make the camera a tiny bit taller and have the view finder always available and slightly bigger I don’t know. I tried several MFT cameras and found I left them at home like the larger cameras. More pleasant to use, but useless when sitting on the desk and not with me. Hopefully you’ll be more disciplined and the GX85 will travel with you when you need it. We all rationalize our purchases, and my opinion is exactly that, an opinion. You can choose to ignore it, I’d make the same comment about Leica purchasers and equally expect to get hosed. After some seriously profitable camera trading (buying new, selling used, heh) I learned that the deciding factor for me was whether the camera is truly pocketable. I don’t wear nerdy jackets and trousers with big pockets, so Panasonic LX-15 (LX-10) did the trick for me. It’s cheaper than the newer Sony RX-100s and I found it much more pleasant to use for still photography. Image quality was a pleasant surprise, too. If I’m going to carry anything larger, it’s going to need a shoulder bag so I may as well pick up the DSLR. Looking forward to the results of your more casual shooting. The lens cap is a bit of a pain, as are collapsing zooms – I realise that now. One handed out of pocket to on to shoot is nice; but I really want that EVF especially if I’m using a longer lens…stability and precise framing can be a bit of a lottery otherwise. JJC makes petal lens caps for the 12-32, although scouring online, reviews have been mixed. Still requires manual extension, so that only removes one step…same issues with normal lenses; if I’m shooting I just leave the cap off. I bought one for my Olympus 12-42 EZ, that is, the newer version that includes a screw on sunshade. I think it’s actually quite good. Better than the Olympus one and the sunshade is a definite plus. It’s not something that will take heavy pro use, but it’s not for a pro lens anyway. I’ve not encountered any problems in the half year period I’ve been using it now and would not hesitate recommending it. Who could argue with your logic, I mean Panasonic makes some great gear and the GX85 seams like a lot of camera for seven hundo. For me though, the camera’s aesthetic must inspire me to want to pick it up. So many compacts go the way of the thin brick and are downright ugly to me. I would have chosen the E-M5 II (4k not needed) with one of the pancakes or even toss a couple of small fast primes in the briefcase. That said, I do wish you many happy snaps with your new camera. Enjoy! I suppose, if 4k video is not required, then why not go back to the RX100-M3? It’s still a very good camera and much more pocketable than the GX85. Bought one back in the day, really didn’t like the shooting experience. The EVF was a huge draw, but in practice just far too fiddly to raise/extend, too small to be useful, and optics that gave me a headache. It’s not really pocketable without a jacket, and if I’ve got jacket pockets, the GX85 and pancake zoom or a small prime will fit, too. My (later acquired) M4/3 gear killed almost all the desire I ever had for a 1″ compact… But I still wish Sony made a pared down and budget RX100 (RX90? ), no tilt screen, less frills, as small as possible… I guess that’s kinda what the Canon G9x is, I’ve actually got a few price alerts set on that one, only 1″ compact I know of that’s truly pocketable (in pants). Good article which I’m sure many relate to. My un-camera is the Canon SL1. I also have a 6D (and a Nikon D7000), but find myself using the SL1 when simplicity and size are of concern, and that’s most of the time. I don’t have any pancake lenses, but I use it with the Zeiss 28mm f2 ZE a lot. I think the price is a joke. Canon has sales on the body for around $250 several times a year. Talk about bang for the buck! I’ve tried mirrorless (Sony a6000) but it’s not as fun or easy to use and ultimately less satisfying. I may get a Ricoh GR one of these days, but until I do, I’ll stay addicted to the size and quality of this cheap tiny camera. I had one of those too – a lot of the recent Tokyo photoessays were shot at the end of last year with one of those 🙂 The STM zooms are surprisingly good, too, as are the 24, 40 and 50 STM lenses. Very good post Ming. I really like Panasonic’s innovation. I will look forward to seeing images from your GX85. Thanks, but I’m not sure innovation is the right word – Olympus did it all already with the EM10 several years ago…this just happens to be a good price-performance compromise. For my un-camera, I compromise on the viewfinder. With that in mind, it comes down to a choice between the Ricoh GR, or the GM1 two lens kit. Both the 12-32 and (cheap) 35-100 are very capable if you understand their limitations. Of course, a lot depends on the airline I’m travelling with, and the purpose of the trip. In Europe, every airline has different rules. For business trips (mostly in economy/option of business or some free money if over ten hours), I rarely have room for more than the above. For holidays, it’s usually a either the E-P5, VF-4 and a couple of Primes, or the E-M5 plus 12-40. For my return to Hong Kong, later this year (holiday, business class, paid with miles), it’ll be the full Monty, with both the E-M5 and A7 II (very new to me, and much to get used to). Family thinks this hobbyist has too many cameras, lenses and camera bags. This hobbyist thinks he has something for every occasion. Incidentally, I dismissed the GX85 as another design by numbers project, when Panasonic announced it. Looks like I was somewhat wrong :-/. I quite like those lenses; landed up with both. The 12-32 has some sample variation, but the 35-100 seems to be really quite excellent. Ricoh GR is still the one for me. An external OVF solves most of the speed problems, the long LCD blackout was really the only problem I had with responsiveness. What it lacks in high ISO noise performance it more than makes up with extremely detailed images and good DR. Plus it is jeans pocketable. I loved that camera, but hesitated to buy another one because it’s now 2017, and the image quality hasn’t changed since 2013, nor has its propensity to be somewhat unreliable – I’ve had control dial issues, a lot of others have had lens issues and dust issues, and that many small moving parts were probably tempting fate. That, and I wanted the stability of an eye level finder, plus some options for greater reach (and the possibility of very compressed but all-in-focus perspectives which I can’t do with my medium format gear). Have a nice time and please keep up! The V3 looked interesting, and there were even a couple of exciting lenses like that 32.5/1.2 (?) – but holy moly it’s one expensive camera! The J5 was too small in hand and felt control-limited. Too bad Samsung fell off the twig. They were making interesting cameras. The NX1 still looks interesting even today; I agree, too bad it was never developed any further than that. I really wanted to get a Nikon DL 18-50, was extremely disappointed that they cancelled them. Now I’ll probably wait for RX100mk6 unless my RX100mk2 bites the dust sooner than that. Smaller Panasonics (GM5 / GX850 / GF9) surely look nice but they don’t have any stabilisation at all and are about the same size as the RX100. I really want improved AF and improved burst buffer an occasional tele-lens, don’t need a viewfinder and could live with crappy Sony menus so it seems like a safe bet. Interesting — and helpful — to learn about your selection process, Ming. I followed you down the D5500 route: I loved the form and was surprised by the DR of the sensor. But the range of DX lenses from Nikon was small; also they were a bit underwhelming optically and fragile in my experience. By an elimination of alternatives not unlike yours I ended up switching to an Olympus Pen-F as a ‘carry around’. I’ve been relieved to find that the µ4/3 sensor has better DR than I feared (it’s the same physical sensor, I think, as in the EM-1MkII). The CDAF is OK (belatedly, I realize my D810 can see in the dark). The body is solid, ‘weatherproof’, and manageable despite its small size when coupled with the Olympus grip. The EVF is bright; the processor quick and battery-sparing. But the real revelation, to me, has been the Olympus Pro-series lenses. Even the zooms are optically wonderful; solid, also weatherproof. Somehow, I think, they contribute to the lovely color and clarity of even the Olympus raws (micro-contrast?). The zooms have a ‘clutch’ to engage smooth manual focussing for precision (e.g. when focus stacking). I needed the 75mm f1.8 prime so haven’t bought the 12-100/4 (now I lust after the 25mm f1.2). I’m happy to call the Pen-F a “camera”; but then I don’t shoot MF. I’m able to use autofocus the EM1.2+12-100/4 in the total darkness, but it requires exposure boost by using longer shutter speeds. Still possible to do hand-held due to the magical stabiliser: https://www.flickr.com/photos/mblsha/33829132900 (0.5″ f/4 ISO6400). In brighter darkness it focuses much better than the EM5.2 and I’m even using darker glass now. With comparable aperture it’s head-and-shoulders above the EM5.2 for focusing in the dark. I suspect the Pen-F would closer to the EM5.2 because it doesn’t have any magical phase pixels. P.S. Beware: the 75/1.8 is not weather-proof and doesn’t have the magical focus clutch. That’s a beautiful shot (of a racoon?) Misha. Really enjoy your travels/Flickr stream. You are right about the Pen-F lacking phase pixels and about the 75mm. But, wow! It crunches. Thanks Peter 🙂 Yes, this was a spooked raccoon that climbed to a tree making a loud noise as it ran over the dry leaves and that’s how I spotted him. Knowing myself, I’d probably end up putting a Nocticron on that GX85. I think M43 provides a nice combination of size and image quality that slots nicely in a niche between “Big” Sony mirrorless and 1-inch compacts… and when you don’t need the depth of field (e.g. video work, landscape, street snaps) but still want full “pro” functionality of the bigger bodies. How is the AF performance of the GX85? I’m currently on Sony A7Rii and although its responsiveness isn’t very good but the AF system (esp. AF-C tracking) works very well. I’m in need of a B-cam good enough for video and small enough for leisure outings… perhaps GX85 is the way to go? [ I too just gave up on finding a carry-always compact. So I got a DXO One (on sale) – at least it’s small enough – and, on it’s own, it has the world’s(?) worst viewfinder. Curious about that DXO thing: is the image quality really that much better than a current (unassisted) iPhone? The main thing that would put me off is the startup time and fiddliness of the whole setup…handiness and speed are necessary traits for the un-camera to justify itself. With the iPhone, with one in each shirt pocket, feels ok, but slower than a handy compact. The One starts the iPhone up if you do it right. There is also WiFi connection, I haven't tried that yet being unsure of extra battery drain, will test soon. I'll have to build the fixture first, I think I know how, and probably add some marking on the front to limit the field of view from 28mm-e to 32mm-e.
Not even quotation marks helped! Begin of cut: After a “less than” sign before “25Mb”. (part of “On ‘arrow’ photo”). Sorry about all this, Ming! You could try the lt (<) / gt (>) entities with ampersand and semicolon: https://stackoverflow.com/questions/5068951/what-do-entities-lt-and-gt-stand-for; if they work on this comment (they’re supposed to appear inside the brackets). No personal battery experience as yet, I haven’t used it intensively enough yet. gives some general info plus a couple of raw & jpeg files to download. gives some tips on battery saving settings. I’ll find a couple of .dng-s less than 25Mb and mail them. I’ve not done action yet, so I can’t really say, reviews mention not very fast autofocus. I’ll think of a way to make some judgement. There is also WiFi connection, I haven’t tried that yet being unsure of extra battery drain, will test soon. I’ll have to build the fixture first, I think I know how, and probably add some marking on the front to limit the field of view from 28mm-e to 32mm-e. I started the stopwatch on my phone. Set the DXO One to manual focus 20cm and disconnected the iPhone. Opened the lenscover (=ON) on a full second. from 2 s upwards, incrementing ~1/4 s.
I repeated this sequence three times. The earliest time a photo was taken was 3 1/2 s after “ON”. This regardless if i shot at plus 3 s or at plus 3 1/4 s.
Shortest time to next photo (raw + jpg or only jpg) serms to be just over a second. Then I tried checking shutter lag by repeatedly shooting on full seconds (still MF). well, not a good test as the spread was greater. I have a Panasonic GM5 for essentially this same purpose, though its default lens outfit is a Panasonic 42.5/1.7 + Panasonic’s small knurled metal grip. Still fits in a hoodie pocket. But like you said, the viewfinder is uncomfortably small. Worse, because of the finder the touch screen is an unfitting 16:9 ratio, which a pretty poor match to the 4:3 sensor — so I can’t use that instead. Sometimes I wonder if I’d be better off with the GM1 and just shooting off of the better 3:2 screen. If Panasonic can fit their 5-axis into a GM5 body, and then make an even bigger sacrifice on the screen size (hey, just get rid of it) to maximize the size of the viewfinder, it’d be a very tempting package. The GX85 is almost that, and I’ve certainly considered it, but I think the size increase — as modest as it is — brings the package too close to my “big” camera, an E-M5ii. I think maybe I should just be satisfied for now, and anxiously await a dream package for pockets. My GM5 certainly fills a role, I’m just greedy and don’t like to make compromises. When the GM5 came out I bought a cheap GM1 ($300 USD), and sometimes I wonder the opposite of you, if I would’ve been better off with the GM5… :p I wanted the little tiltable flash (it’ll do in small bars and clubs) and the larger screen tho. OTOH the GM5 has eye detection AF AND Auto ISO under Manual, which I really really wish my GM1 had. I’m still happy with it and nothing has tempted me to replace it, and my second body is an E-M5 II just like you. I think Panasonic almost got those little bodies too right, and iterated on the first one too quickly. Everyone that fit their niche either bought one right away or bought one of the two on fire sale, a third iteration (or long term GM5 sales) just wouldn’t add much right now. Probably why they put out a cheaper and cheaper built GX850 instead, that one’s tilt screen is actually the only thing that’s truly tempted me but ehh… Still happy with the GM1, tho I could probably get back all $300 that I spent on it if I sold it today. Ming: I have the same question and chuck a trusty Coolpix A in an Urban Disguise when traveling on business. I added a Nikon 3300 and the excellent AF-P VR lenses + 35/1.8 set for cost of a good pair of shoes and about as small a body and sensor as I want to go. Not hip or flashy, but very useful.